drink the good stuff! : Get your lists straight people! Get your lists straight people! Oh brother, another night out and another lame wine list. Your winemonkey was just on a couple of recent nights out with some very lovely ladies and some very lovely couples and as usual the wine list was shunted to me. No problem, I can deal with that. It is my expected duty and I take my job as the "official wine picker" very seriously-- especially when you have to make everyone happy. No, the problem is that the wine lists I receive are woefully bad. You've seen them too, I'm sure. Too pricey here, not enough selection there. What is it about restaurants that they just think gouge the customer when they build their wine list? Usually you can just eek out one interesting bottle that is not overpriced (in terms of markup) and will fit the bill. One. The thing is I know there is good wine out there. I've seen those lists and reveled in them. There are interesting choices at all sorts of price points that match up with food. They are not over-marked up. They are not standardized quicklists from major distributors like Southern or Peerless or (God forbid) Paramount-Eber Brothers. 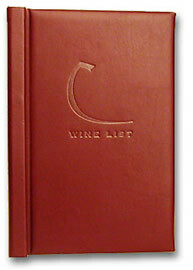 Why can't most restaurants put even a tenth of the effort in building a wine list that they do in building their menu. It shameful. And we all are worse off for it. I've GOT to start picking the restaurant. I am so glad you brought this up. I developed the wine list at the restaurant that I run and now whenever I go out I am a bit critical...no not critcal...dissapointed. Even the list has decent wines they will be catagorized into wied groups that are confusing "light and fizzy," dark and luscious." I would rather see a well organized wine list and be able to ask the waiter or sommilier or whatever (it all lumps together in NYC)and get an honest answer. Southern is hard to avoid sometimes and I love a challenge. But People need to understand the boutiqes are where its at. Wine Symphony, Pelloneda, even Lauber are awesome comapnies with low-yeild quality virtually unknown stuff.Sorry for the rant but your post today drove home an important point. Thanks again for bringing it up. Restaurants need to know.